[I]’ve logged enough miles dining at restaurants in Maine to wear out my odometer, so to learn of a high-end French restaurant in the forests of Aroostook County — one that’s been there more than a decade and that I’d never heard of — was a surprise. The Canterbury Royale website promises “a unique private dining experience offering the Menu of Kings.” When I called for a reservation, I was told to await an email inviting my companion and me to select our entrées — a bit like a wedding reception RSVP. The email arrived with an attached “Edwardian Menu” (with zero design savvy and some avant-garde capitalization choices) featuring a long list of classic French entrées like beef bourguignon, filet mignon, and stuffed quail, plus other European dishes like osso bucco. 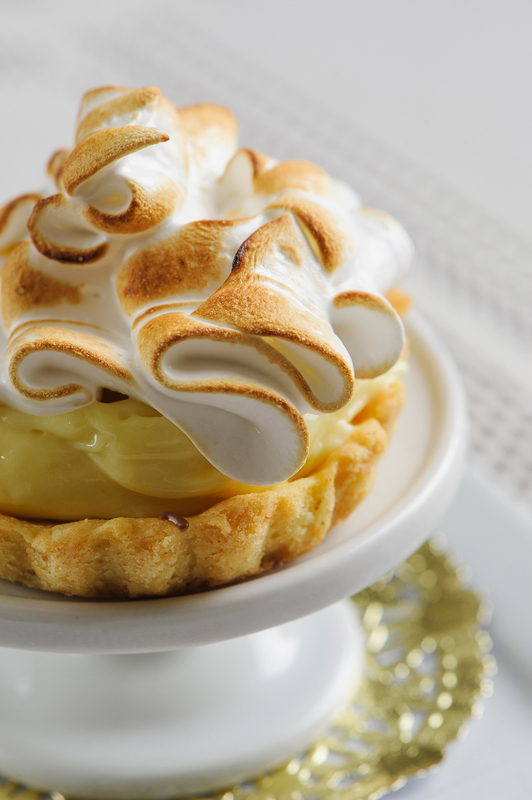 The prices, from $55–$75, included four courses and dessert. 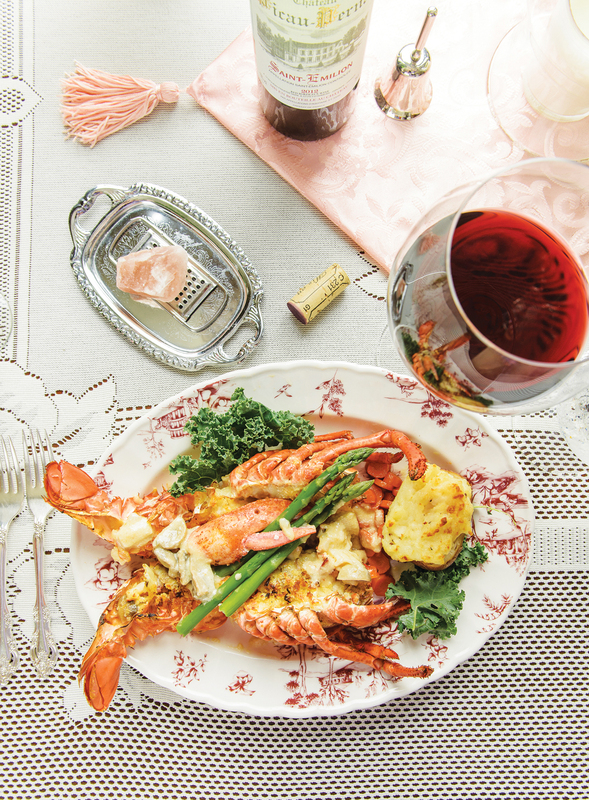 We chose lobster thermidor and pheasant sous verre (under glass) — dishes we figured would serve as litmus tests for any chef claiming to specialize in haute French cuisine. A glass of Bordeaux complements an entrée of lobster thermidor with Napoleon Cognac. Crispy fried onions garnish an early course of pureed celeriac soup. Canterbury Royale draws raves for its housemade croissants. A few days later, my pal and I were 300 miles north of Portland, rumbling down a country road an hour after sundown with the high beams on — to avoid deer, but also to find our restaurant. We reached a narrow driveway leading to a low-slung cottage with chalet-style brown batten siding and lacy trim: our destination, said Google Maps. It looked like someone’s cozy home, and I briefly envisioned going door to door in search of a resident who’d serve me lobster thermidor. 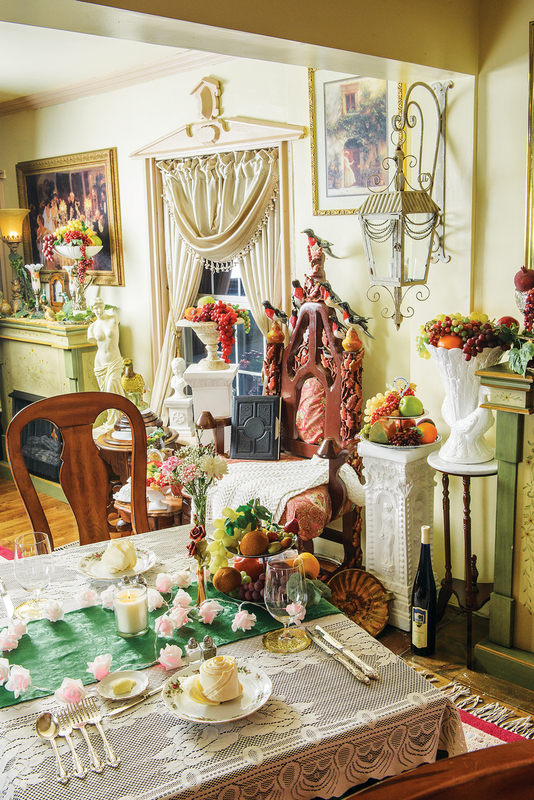 I might have been delirious from the five-hour drive — but the scene in the dining room inside only contributed to my dreamlike state. 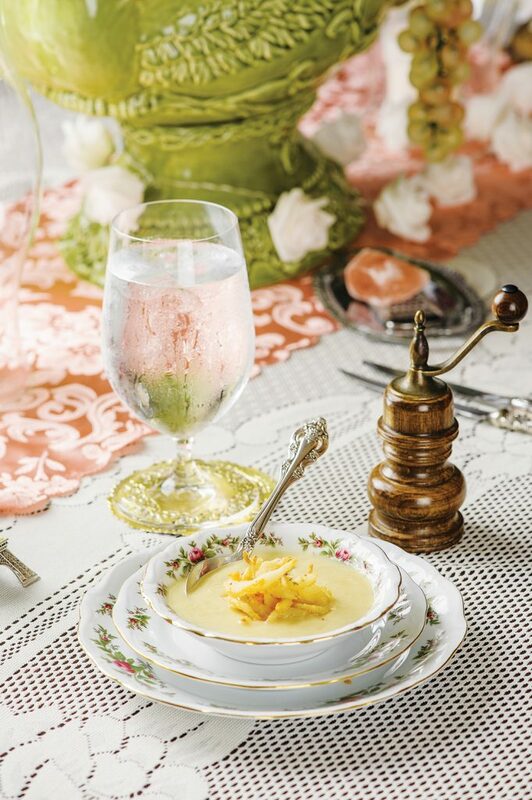 Flickering candles and tulip-shaped table lights cast a soft glow on a series of panels depicting Belle Époque Paris. 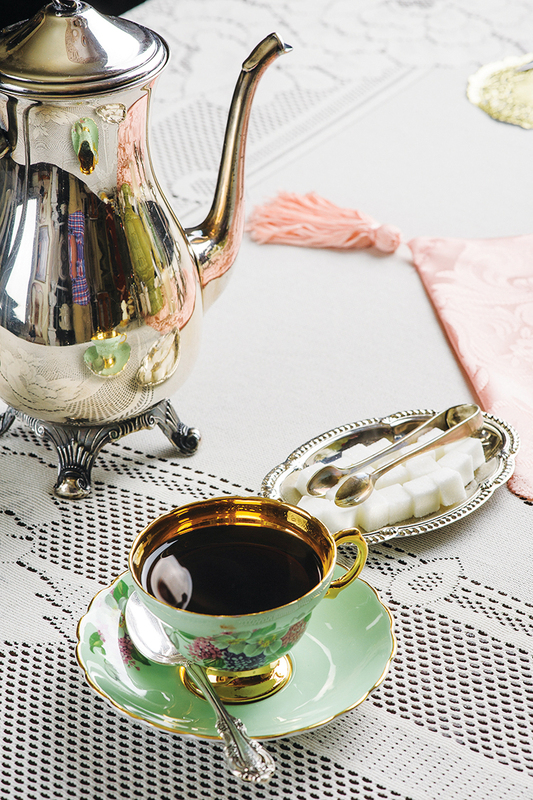 The table, draped in lace, was set meticulously, silverware exactly 4 inches from the edge. Side tables were laden with candelabras, flowers, towers of fruit. The windows were draped in satin, and marble statues stood like sentries on either side of the fireplace. We felt like we’d stepped into a fairy tale — or maybe the Mad Hatter’s tea party, except I seemed to have swapped tea for absinthe. 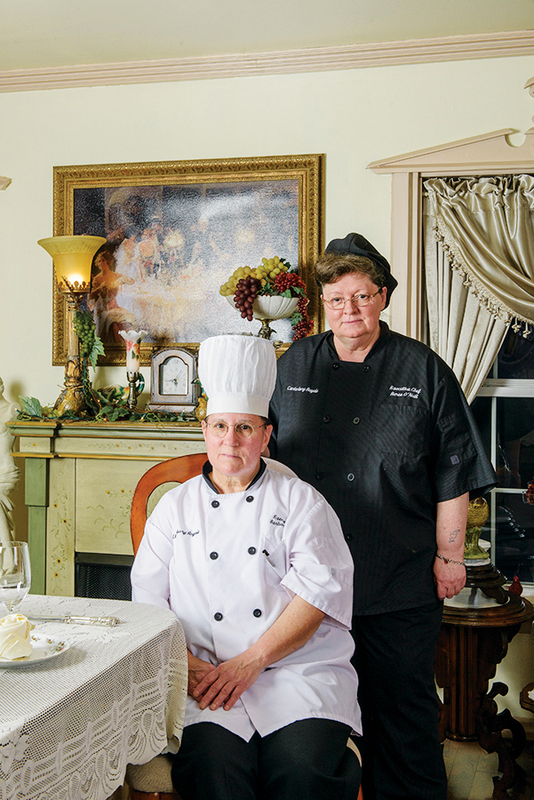 Canterbury Royale’s facade is unassuming, but chefs Barbara Boucher (seated) and Renee O’Neill have spent more than a decade garnering accolades for their fine French cuisine in Fort Fairfield. 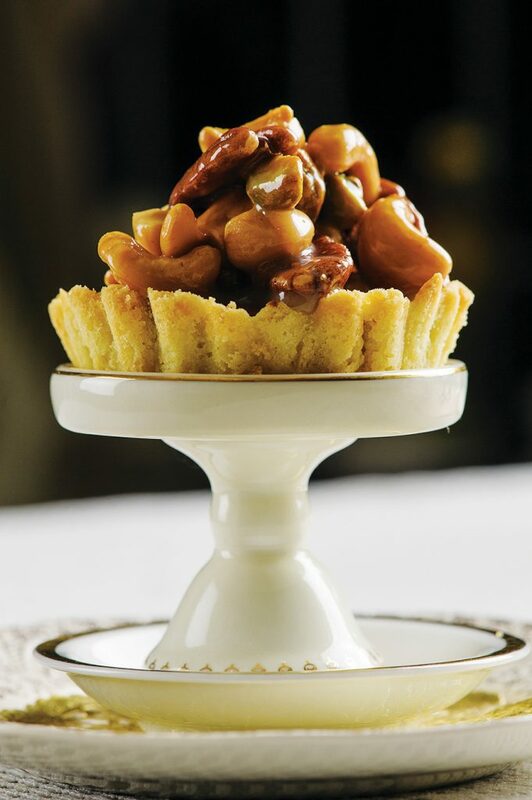 Below: A salted caramel chocolate nut tartlet is among the dessert cart delights. We were greeted by Renee O’Neill, co-owner and co-chef of Canterbury Royale with Barbara Boucher. 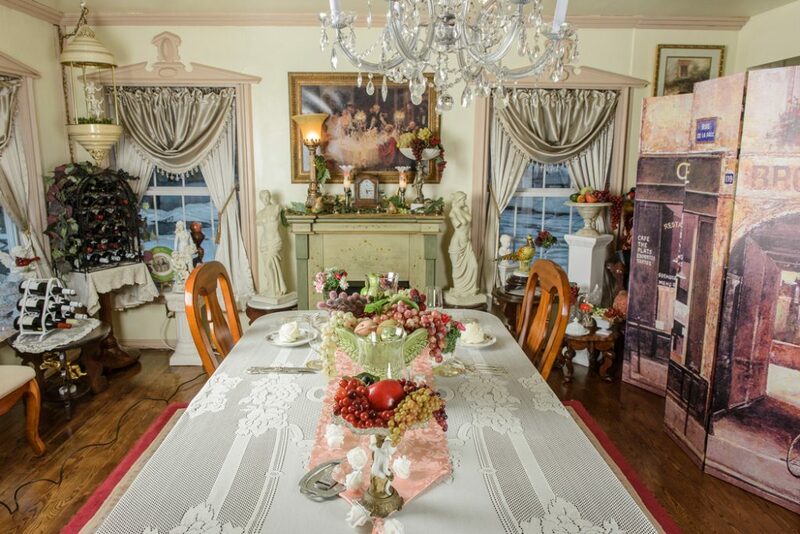 Together, they oversee both the kitchen and the front of the house, but on this evening, they’d enlisted an extra server to accommodate a party of eight in the main dining area. Our table was in a cozy private room with its own fireplace. O’Neill and Boucher opened Canterbury Royale in 2004, after relocating to Fort Fairfield from Connecticut. Twelve years later, they still consider the restaurant a work in progress. Canterbury Royale has just one seating per evening, allowing O’Neill and Boucher to lavish attention on each guest. One of the most challenging aspects of such an ambitious kitchen in a remote location is the availability of goods, so I was especially impressed with the wine selection, representing various regions of France. Bread service arrived soon after we were seated. The croissants, hot from the oven, were buttery on their own, but I couldn’t resist letting an extra pat melt into every layer before devouring them. 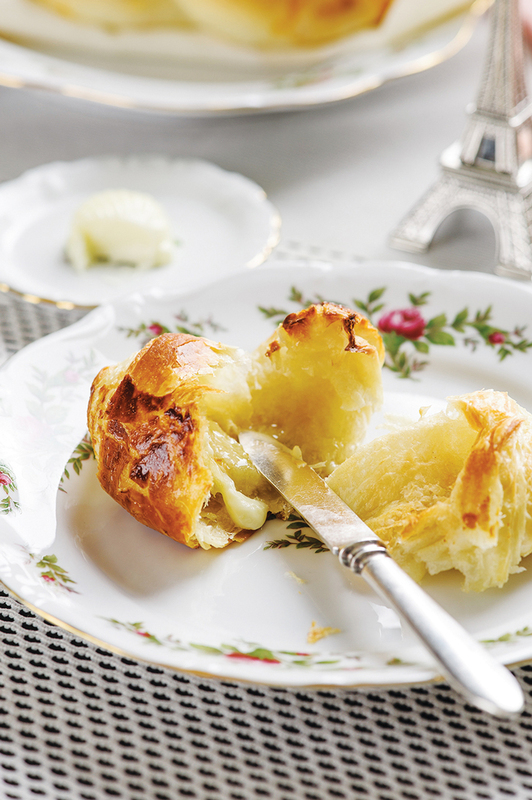 They somehow combined the soft, flaky melt-in-your-mouth tenderness of a great croissant with the guilty pleasure of a Pillsbury Crescent — and I mean that in the best way. 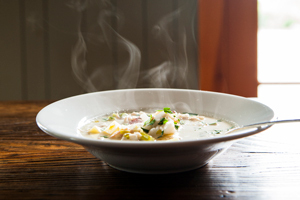 We reserved the accompanying braided onion bread for the soup course, a velvety puree of celeriac garnished with crispy fried onions. 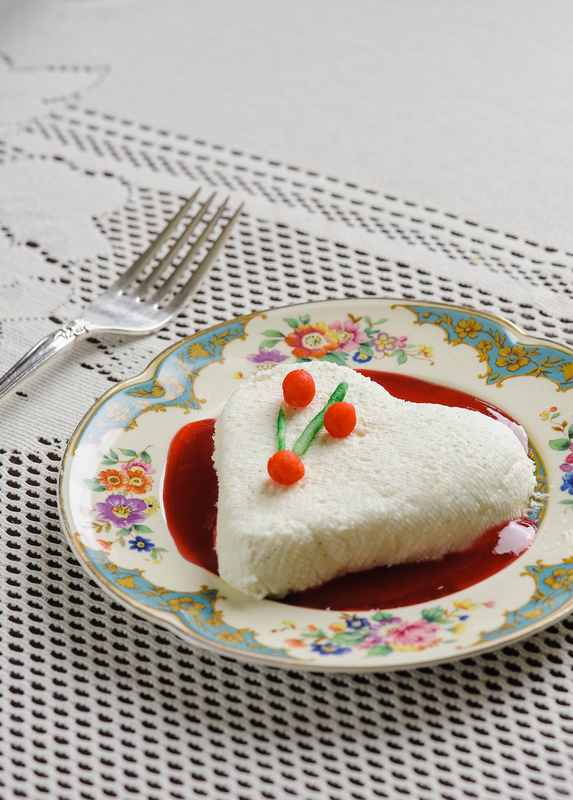 Our server described each course in detail, otherwise leaving us to enjoy a drawn-out meal at a relaxed pace. 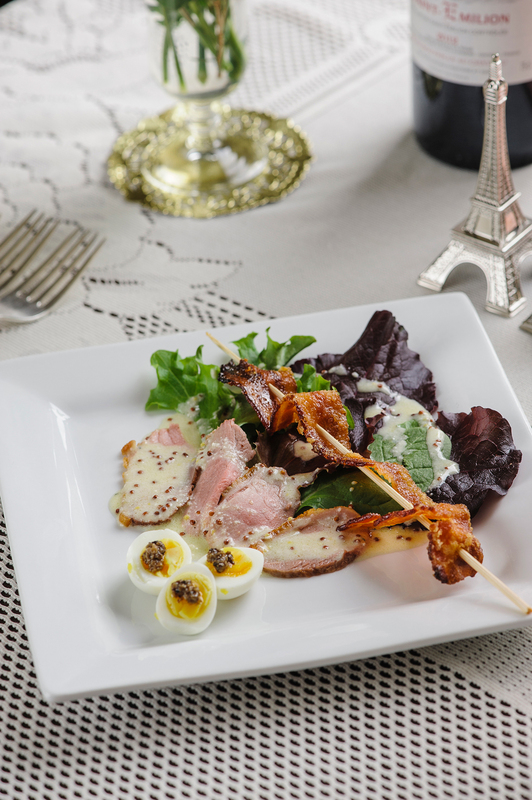 The next course was tender roast duck breast fanned out over a bed of greens and enveloped in a creamy white truffle sauce, accompanied by two soft-boiled quail eggs topped with chopped black truffles. Chef Renee appeared at our table with a smoke-filled glass cloche, from which she administered to each of us one crispy slice of the most sublime bacon I’ve ever eaten, its mesquite flavor offset by a hint of sweetness, the result of a spice blend Renee prefers not to divulge. Between courses, we eavesdropped on the party of eight, enjoying what sounded like pleasantly stunned reactions to every bite. Our main courses arrived, and I took delivery of another glass cloche, this one containing delicate, perfectly cooked pheasant. Fresh morel mushrooms, with their intense flavor of damp earth, were a fine garnish, along with a white wine cream sauce. The lobster thermidor, an extravagant dish often considered a bit old-fashioned (it was on the menu of the last dinner served on the Titanic), was slowly cooked in a liberal amount of butter, cream, and egg yolk, then finished with Cognac (in this case, high-quality Courvoisier Napoleon). The sweet, succulent chunks of meat separated easily from the split carapace of the lobster. Highlights from the dessert cart included an outstanding French coconut pie with a savagely delicious crust. Over coffee, we met and chatted with both chefs, each wearing a different style toque. We learned that much of the décor, down to the paintings and sculptures, is the work of their hands. “We knew that whatever we wanted to create out here, we would have to build it ourselves,” Renee said. 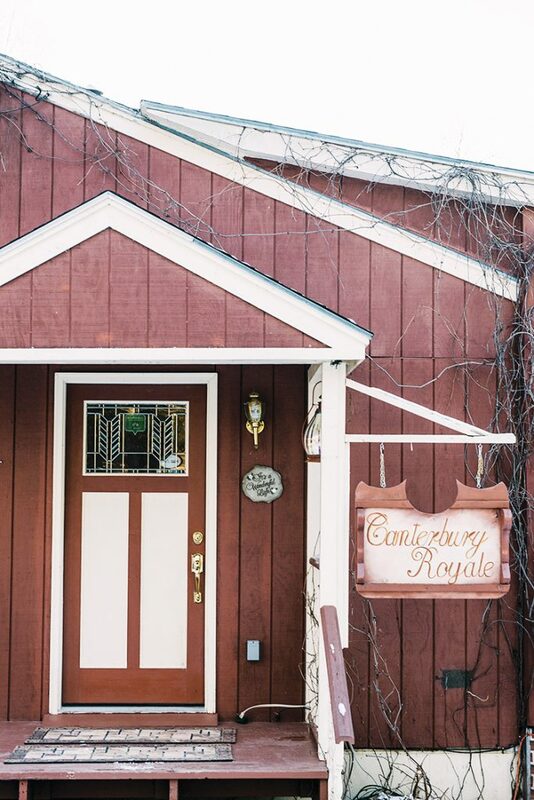 Suffice to say, there is no other place in Aroostook County quite like Canterbury Royale. No place in Maine, in fact — maybe no place on earth.